Tzitzit or Tzitzis (Hebrew: ציצית) are "fringes" worn by Jews on the corners of four-cornered garments, including the Tallit (prayer shawl) and Tallit Katan. Since they are considered by Orthodox tradition to be a time-bound commandment, they are worn only by men. There is a positive Torah commandment to place Tzitzit strands on each corner of a four cornered garment that one wears. This obligation extends to any garment with at least 4 corners, for instance, a 5 or 6 cornered garment. On such garments with more than 4 corners, one should only attach Tzitzit to four of the corners. The corners chosen should be the corners that are the farthest away from each other. However, bedieved, one may make a bracha on the Tzitzit, even if they were not placed at the farthest corners of the garment. NOTE: There is a mitzvah of chinuch, to train and educate one's progeny in their formative years of childhood, despite the fact the obligation of mitzvah observance is only upon Jewish adults. This calls for to train and educate children in the ways of Torah living. In the famous words of the wisest man, Chanoch l'naar al pi darko… "Train a child in the way he should go; when he matures, he will not deviate from it" ((Proverbs) Mishlei 22:6). What is the underlining nature of this mitzvah? The word "chinuch", often translates as "training" or "education", actually means "inauguration" (Rashi, Bereishis 14:14). There is nothing as important as the inaugural stage. It establishes the precedent from where everything subsequently flows: "Everything follows after the origin" (Pirkei DeRabbi Eliezer Ch.42). It is the map indicating the direction in which one is heading. In the life of a Jew, chinuch is the basic introduction to Judaism for one's offspring. Speak to the children of Israel, and say to them that they shall make for themselves fringes on the corners of their garments, throughout their generations, and that they shall affix a thread of sky-blue [wool] on the fringe of each corner. So that you shall remember and perform all My commandments, and you shall be holy to your L‑rd. So do women and children need to wear tzitzit? Yes it is applicable to all, men, women and children. In Israel we mostly see men wearing them and fewer women due to rabbinical laws. Elohim made this ordinance for all as mentioned in Numbers 15:38 where it says “speak to the children of Israel”. It does not say speak only to men. The law is applicable to all. We are told that the mitzvah of tzitzit is equivalent to all the mitzvot, because it reminds us of all of them. As Rashi explains, the gematria (numerical value) of the word tzitzit (ציצית) is 600. Six hundred, plus the five knots and the eight strands, equals 613, which is the number of the mitzvot. Our sages say that one who fulfills this mitzvah properly merits to have a wife and children. He is also protected from sin, and in that merit he is assured that he will see the face of the Shechinah (Divine Presence). This mitzvah is not an obligatory one. Only when one is wearing a garment of four (or more) corners is he is required to affix tzitzit to the corners. If he is not wearing such a garment, he does not transgress by not wearing tzitzit. Despite this, an angel taught Rabbi Ketina6 that at times of divine wrath, G‑d punishes people for not assiduously pursuing mitzvot, even those who choose not to wear a four-cornered garment in order to exempt themselves of this special mitzvah. For this reason, it is proper that men and boys wear a four-cornered garment, with tzitzit affixed to it, every day. This garment is called a tallit katan (“small shawl”), or simply tzitzit. In fact, according to the master Kabbalist the Arizal, it is proper to wear the tallit katan at all times, even at night—although halachically a “night garment” is exempt from tzitzit. As the laws of tzitzit are quite extensive, this article will focus on some of the more common issues. In addition, we will address the laws of the tallit katan rather than the laws of the tallit gadol (the larger tallit worn only for prayers). In order for a garment to require tzitzit, it must have four corners. It must be a garment for the body and not just the head (such as a shawl).10 But, unlike an ordinary shirt, the four corners must include two in the front and two in the back. If the front and the back of the garment are connected at the sides, a clear majority must still be disconnected. According to R. Schneur Zalman of Liadi, the tallit katan should be completely open on both sides, and not be attached with any stitches or clasps. Certainly, the garment should not have sleeves. The garment must be of a woven material, and preferably, it should be made of wool and be white. The strings of the tzitzit need to be spun specifically for the sake of the mitzvah of tzitzit. For this reason, the spinning has to be done (or at least overseen) by a Jew over the age of bar mitzvah. It is therefore very important to buy/receive tzitzit that are made by a reliable person. Otherwise, one may mistakenly wear a pair of tzitzit that is not halachically acceptable. •If one of the eight strings is ripped off entirely, the tzitzit are still kosher. •If a second one is ripped completely off, the tzitzit may or may not be kosher, depending on various factors. •If three strands rip, it may not be kosher even if they are not ripped off completely. In recent years there have been several attempts to revive the mitzvah of dyeing one strand of the tzitzit with techelet. True techelet is a special blue dye made from the blood of a fish (or sea creature) called the chilazon. In ancient times, one of the strings of the tzitzit was dyed with this dye. The color was to remind us of the heavens, and thus of the throne of divine glory. We have lost the tradition as to the identity of this creature. Nevertheless, based on various sources and discoveries, there are many people who use the blood of a sea snail called murex trunculus. However, R. Shalom Schneersohn, the fifth Chabad-Lubavitch rebbe, and many other Torah giants do not agree that this is the true chilazon mentioned in the Torah. They believe that the chilazon will re-emerge only with the coming of Moshiach. If one slept in his tallit katan, he may not recite a blessing on it in the morning. Rather, he should keep the tallit katan in mind when he recites the blessing on the tallit gadol. The blessing on the tzitzit must be said while standing.23 If one is sick or weak, he may make the blessing while sitting. It is proper to wear the tzitzit strands in a visible way, so that they remind one of the mitzvot, as the verse says: “You will see them and remember all the mitzvot of G‑d.” If one is afraid of being mocked in public, he may tuck them into his clothes. The custom of the Arizal was to keep the tallit katan completely covered, but this is not proper for the average person, who should rather keep the actual tzitzit uncovered. Did Noah Eat Kosher too? Now "every green herb" above doesn't mean "every single existing green herb." It means "every green herb that is appropriate for food." Clearly neither Adam or Noah were eating poison ivy salads or snacking on poisonous berries! Does Scripture support limiting green herbs this way? Sure, let's look at Genesis 6:21: "And take thou unto thee of all food that is eaten, and gather it to thee; and it shall be for food for thee, and for them.'" Note that Noah is commanded to take all the edible foods into the ark. So then, not 'every green herb' was edible, only 'every green herb given for food' was edible. If you come to my house to spend a week, I will encourage you to raid my refrigerator and eat anything in it. Does that mean I'm encouraging you to eat the box of baking soda and my tins unit patches that are also in my fridge? *Every* and *all* need to be defined within proper context of what G-d deems suitable for human consumption. We know G-d made known to Noah the distinction between clean and unclean animals (Genesis 7:2,8); it is clear from earlier texts that G-d had instructed man on which green things were suitable for human consumption; it is only logical that G-d also revealed which animals were fit for human consumption when he broadened man's diet to include animals ... clean animals. Basically, the clean animals that could be sacrificed were also the animals which could be eaten; later confirmed by reiteration in the Torah given at Sinai. Do you take the words of the Bible line upon line and precept upon precept? Do you live by the whole word or just the Brit Chadasha? 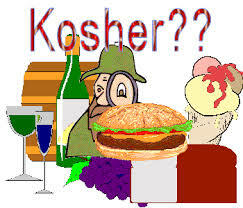 My next question is, are you keeping kosher laws? While many believe that we are not bound to the dietary laws of the Old Testament. I don't necessarily think you are hypocrite for not doing so, but I do think that the laws (instructions) in the Tanach should carry a lot of weight in how you live your life and shows the wisdom of God in caring for the health of His people. Yeshua did not do away with the kosher laws... Yeshua obeyed “all” of the commandments of God perfectly and taught others to do the same. Yeshua kept biblical kashrut, as a real Jewish man. He had to be in order to be the "spotless" Lamb of God, offered not only for the sins of Israel (Jacob), but also for the sins of the entire world, for all time. He had to obey all of the Word of God to be “spotless” and the Brit Chadasha was not written yet so…that means the Tanach is what He obeyed! Therefore I submit to you, if Yeshua and His disciples kept a kosher life why shouldn’t we? Yeshua only did away with the laws of sacrifice. We don’t have to sacrifice anymore because Yeshua was the perfect sacrifice! All other “laws” of the Bible are still in force. Jesus said he did not come to abolish the Old Testament. Matthew 5:17-18: Do not think that I [Jesus] have come to abolish the Law (Torah, the first 5 books of the Bible)) or the Prophets (the rest of the Old Testament); I have not come to abolish them but to fulfill them. I tell you the truth, until heaven and earth disappear, not the smallest letter, not the least stroke or a pen, will by any means disappear from the Law (the Old Testament) until everything is accomplished. Is everything accomplished? I don’t think so…He has not returned yet. We are often given the impression that Yeshua was an iconoclast, destroying all that was before and replacing it with something “new”. Yeshua brought the lost meanings back to ceremonies and practices, the observance of which had often become automatic and empty. Yeshua did not break the Torah of God or biblical kashrut, but He was often in conflict with the Oral Torah. At Yeshua’s trial even His enemies could not accuse Him of not keeping biblically kosher. If Yeshua had not kept kosher, it would have no doubt figured as a very significant part of the accusations at His trial; but it did not. Yeshua kept kosher. It is easy to be so busy in “observance” and to be involved in it that you never stop to ask why? or, What is God teaching here? Are pigs evil? Are shrimps in league with the devil? Were the laws of kashrut purely arbitrary? Did God give the regulations simply to cramp Israel’s style? God is not like that. The social laws and kosher regulations were intended to teach about separation and holiness, so preserving the Messianic line in preparation for the birth of Yeshua. If you could not eat with the pagan nations you could not socialize or be infected by pagan ideas and practices (Exodus 34:15). In 1 Thessalonians 5:22 we see the principal of kashrut contained in the New Testament instruction about the believer’s pursuit of daily holiness: “Abstain from all appearance of evil.” This principle corresponds with the injunction of Leviticus 19:2: “You shall be holy, for I the Lord your God am holy.” Leviticus 19 then lists what is kosher or forbidden. Did Yeshua Change His Mind? Some Brit Chadasha Verses that are used to "Prove" kosher laws are no longer in effect. 1) If Yeshua does not change his mind, then why do some interpret Matthew 15:1-20 as evidence that he did change his mind about clean and unclean food? Could it be that this Scripture has been taken out of context? "What goes into a man's mouth does not make him `unclean,' but what comes out of his mouth, that is what makes him `unclean.'" Matthew 15:11 As we read not just verse 11 but all of it we will see the context of “eating with unwashed hands,” not abolishing clean and unclean dietary guidelines. The issue here concerned hand-washing -- Opponents need to read whole passages, this one begins in 15:1. Yeshua was asked why his disciples didn't wash their hands before eating. Since their argument against his disciples came from manmade traditions, Yeshua asked them why they broke Torah but not tradition --- showing they put tradition higher. He concludes by calling a crowd and declaring that true uncleanliness comes from within man, not from the food he eats. Does that make all meats clean? I don't see how. The issue wasn't about abrogating G-d's kosher laws but about the traditions concerning hand-washing/eating with un-washed hands. One should be careful when making applications with verses. “In pre-Pharisaic times, the washing of hands was necessary for handling holy objects (Shabbat 14b). This was later extended to handling food. But here once again, there was a debate between Shammai and Hillel [the two main Pharisaic schools]. Shammai insisted on washing the hands before filling the cup...In fact, in their commitment and zeal, some had gone so far as to define eleven categories of pollution which could defile a utensil.” Jesus, Early Judaism, and the Pharisees main complaint here was not consistent with the mainstream Pharisaic teachings concerning “washings.” Another point is that if Yeshua had rendered all food clean in Matt. 15, then his teaching would have been inconsistent. They had just accused him of not following the traditions of the elders and he responds with “You have let go of the commands of God and are holding on to the traditions of men.” Clean and unclean dietary guidelines are not based upon the traditions of man but are the commandments of God! Many credit Sha’ul with changing the clean/unclean dietary commandments as well. Would Sha’ul do such a thing? He states in 1 Corinthians 11:1, “Follow my example, as I follow the example of Messiah.” I believe we will see below that this devout follower and observer of the Torah would in no way cancel the dietary guidelines. What did Sha’ul say about himself? Further, in 14:14, the word unclean comes from the Greek word "koinos" meaning common; it's not the Greek word "akathartos" which is used elsewhere to mean ritually or ceremonially unclean. No surprise, since ritual cleanliness wasn't the issue. What is the context of Sha’ul’s teaching here? Since he just reaffirmed obeying the Torah in the previous chapter, I believe Sha’ul is addressing man’s conscience concerning eating or refraining from eating “clean” food (i.e., meat). He addressed a similar situation in I Corinthians 10 about eating food in an unbeliever’s house. I’m sure that each of us at one time or another has refrained from eating meat or other foods because we didn’t know its origin or how it was prepared. I, for one, can relate to this situation having travelled in foreign lands (including Rome). We must conclude from Sha’ul’s testimony, we know that he did not break the commandments of God nor teach others to do so. So why would we think that Sha’ul is cancelling the dietary guidelines in Romans 14? 3) Mark 7:19 "Because it goes not into the heart but into the stomach, and goes out with the waste? (He said this, making all food clean)." What is food to Jewish people? G-d only sanctioned *clean meats* as food for man. Do you really think pork is considered a food in a debate among observant Jews? NO! Unclean meats aren't even up for debate here since unclean meats aren't even considered *food* by the observant Jews in this discussion! The issue again in this passage is eating with unclean hands! Can unclean hands change a clean food into a unclean food? Yeshua's answer is clear --- NO! What makes a food ritually clean is G-d's sanctioning -- not washing your hands! Read in context, we see clearly that unclean meats are not up for discussion here, just as in Matthew-- the hand washing rituals of the Pharisaic tradition are. Yet some Christians read this passage as if everyone went out and ate pork after this speech! Oy! Gentiles, by their pagan lifestyle, were considered unclean by all Jewish people, even by Yeshua and the apostles. Here, God gives Kefa a radical vision to show him that he was bringing the Gentiles out of paganism into the ways of the Torah. God miraculously confirms this by giving a witness, the Ruach HaChodesh (the Holy Spirit). Many misinterpret Kefa’s vision because they fail to read “all” of this Scripture and, once again, within context. Unclean men are being declared clean here -- not unclean meats. With this revelation, Kefa took the gospel to the gentiles, starting at the house of Cornelius. A few problems using this passage to support eating unclean foods --- *G-d* is the one who forbade the eating of unclean meats but this passage shows in verse 1 that it is dealing with teachings that come from seducing spirits and the doctrines of devils. This isn't abrogating the kosher laws of G-d's Torah but serves instead as a warning of evil spirits that teach abstaining from certain foods. The text doesn't tell us what foods were being forbidden, only that we should not heed such the restrictions because they come from an evil source. Be very wary: To say that G-d's kosher laws regarding 'clean' and 'unclean' fall under the heading of "doctrines of devils" or "seducing spirits" is attributing G-d's Holy Torah to hasatan. May it never be! Furthermore, this passage is coupled with the teaching of forbidding marriage -- the Torah teaches marriage is good for man and strongly encourages marriage. So we know this passage has nothing to do with Torah teachings. This passage serves as a warning against following evil teachings -- it does not teach to disregard the kosher laws of Torah. The distinctions between clean and unclean animals always existed, from Genesis 7:2's "Of every clean beast thou shalt take...." to Revelation 18:2's "...of every unclean spirit, and a hole for every unclean and hated bird." In 96CE when Revelation was written, 'unclean' animals were still distinguished from 'clean' animals; G-d *never* revoked His kosher laws. Remember, in Scripture, there are always spiritual reasons for every physical commandment that God gives us to obey. The dietary laws are designed as a call to holiness. The ability to distinguish between right and wrong, good and evil, pure and defiled, the sacred and the profane, is very important in Judaism. Imposing rules on what you can and cannot eat ingrains that kind of self-control. In addition, it elevates the simple act of eating into a religious ritual. The kosher laws are also Gods’ way of ensuring our health and wellbeing! Don’t you care about your health or care to obey God? God gave these health laws for everyone, not just the Jewish people. For your health, refrain from eating the unclean and unhealthy foods that will take you to an early grave. Most importantly obey Gods’ advice (or dare say command) and keep the kosher laws. You will be better spiritually and physically! "Daniel did not want to defile himself by partaking in non-kosher food." in Daniel 1:8! Kosher law traditions forbid the eating of pork. There are over 50 different parasites that live in pigs, and many of them survive the temperatures of frying, like frying bacon, and that's not to mention the toxins which pigs have no means of purifying! Leviticus 11:7 And the swine, though he divide the hoof, and be cloven footed, yet he cheweth not the cud; he is unclean to you. Leviticus 11:8 Of their flesh shall ye not eat, and their carcass shall ye not touch; they are unclean to you. "Clean" animals, as sighted in the Bible, have three stomachs that purify their food before the nutrients enter the blood stream. Pigs have no such purification system, and since pigs are scavengers, they are designed to take in toxins, and die with them and the parasites that thrive in them! Also, pigs keep most of their contagious uric acid in their bodies! their fat tissue, which you eat? They will eat anything, snakes, dead animals, and even human flesh! Come on now…think about it…read up on it! Another interesting fact about pork is related to how the human body digests animal fat. The process is called hydrolysis. Studies show that when you eat animal fat, it undergoes a conversion process that changes it from beef fat, for instance, into human fat—the form in which it is stored in the body. This allows the body to remove some of the toxins and to create tissue that is able to be converted into energy when needed. Yet, pork is not subject to hydrolysis. Anytime you have pork chops or sausage, its fat is stored in the body as PORK FAT! As we have discussed, fat stores much of the toxins. Therefore, you are storing the most toxic form of the animal! Also, kosher law traditions forbid the eating of shellfish. The rational basis is that shellfish feed on floating and bottom waste or accumulate heavy metals or toxins in their tissues. Another is that some of these dishes are consumed raw (oysters, mussels, clams and shrimp, most notably) and have the potential to cause serious illness from shellfish poisoning. Thus, shellfish such as lobsters, oysters, shrimp, clams and crabs are all forbidden. Fish like tuna, carp, salmon and herring are all permitted. Of the "beasts of the earth", you may eat any animal that has cloven hooves and chews its cud. Lev. 11:3; Deut. 14:6. Cattle, sheep, goats, deer and bison are kosher. Of the things that are in the waters, you may eat anything that has fins and scales. Lev. 11:9; Deut. 14:9. For birds, the Torah provides a list of forbidden birds (Lev. 11:13-19; Deut. 14:11-18), but does not specify why these particular birds are forbidden. All of the birds on the list are birds of prey or scavengers. Other birds are permitted, such as chicken, geese, ducks and turkeys. Of the "winged swarming things" (winged insects), a few are specifically permitted (Lev. 11:22), but the Sages are no longer certain which ones they are, so all have been forbidden. We do know that Yochanan the Immerser ate locusts and wild honey Mat 3:4. Rodents, reptiles, amphibians, and insects (except as mentioned above) are all forbidden. Lev. 11:29-30, 42-43. Any product derived from these forbidden animals, such as their milk, eggs, fat, or organs, also should not be eaten. Rennet, an enzyme used to harden cheese, is often obtained from non-kosher animals, thus kosher hard cheese can be difficult to find. All fruits and vegetables are kosher. However, bugs and worms that may be found in some fruits and vegetables are not kosher. They are filled with ethnic and religious objects--and everyday objects imbued with special meaning. In Judaism and, I imagine, most other faith traditions, the spiritual is material. Without things, in all their thingness, there is no Passover, only an idea of Passover; and a faint and fuzzy idea it would be, like honor, loyalty, and remorse–like, perhaps, God, and more surely, monotheism. Things denote one’s belonging, one’s participation, possibly one’s convictions. Where are most of these things that point toward and create Jewish life and identity but in the home? Within Jewish homes, things, people, and even times of day and seasons of the year and of life interact in a fluid process, through which things make the home Jewish, by which things are animated by Jewish life and absorbed by it in specifically Jewish ways. 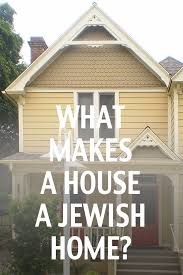 In my anthropological research on Jewish-American material culture in homes, I have been attending to how my human informants, the creators and keepers of Jewish homes (more often women than men, but not always), reflect upon how things make their homes Jewish, and how things found in the home facilitate Jewish living and create, maintain, and transmit Jewish identities. Three categories of objects help me to understand and experience what I am seeing. First, certain standard markers serve as unambiguous “signs” or “indications” that a Jewish home has been intentionally constructed, and is being continually constructed–by the objects themselves and by a range of interactions people have with these objects. Call this first category of objects: articulate, revelatory, self-evident, and unambiguous. One could call objects in this category: signs which say “a Jew lives here”; props which say, “I am needed in Jewish life”; or catalysts which say, “my very presence creates Jewish ways of being and doing.” Often they are all three: signs, props, and catalysts. Such things in this category facilitate, instigate, or suggest Jewish ways of being, create and enforce Jewish identities, and serve as reminders that one’s home is Jewish. One informant has described such objects as the boundary-keepers she sets up in order to distinguish and protect the Jewish identity of her home from the largely non-Jewish world in which her family lives. One could just as easily say that it is not this informant who is setting up the objects to create boundaries, but the objects themselves that create a boundaried world in which my informant lives. In Jewish-American homes, the most familiar and visible objects in this category might include a mezuzah [parchment and case hung on doorways], Hanukkah decorations, Sabbath candle sticks that are displayed and used, a kiddush wine cup (often silver), a prayer book, a Bible, and other ancient sacred Jewish texts, a Jewish calendar (distributed by a synagogue, kosher butcher, or Jewish funeral parlor), a drawer of yarmulkes harvested from various celebrations, a Hanukkah menorah, artwork depicting Jerusalem, displays of New Years, Hanukkah, and Passover greeting cards that change with the season, sentimental or nostalgic artistic images of serene shtetl mothers in scarves lighting Sabbath candles or bearded old rabbis worshipping and studying in destroyed European villages, tzedakah [charity] coin boxes designated for some Jewish cause or charity, kosher wines, loaves of challah, the boxes of matzah. And just about anything with Hebrew letters written on it: from an illuminated ketubah (wedding contract) and Hebrew letters in primary colors magneted onto a refrigerator to a red-and-white can of Israeli Coca-Cola, brought back as a souvenir from an El Al flight to Israel. Things that are signs, props, and catalysts enter one’s home in a variety of ways: as purchases, souvenirs, gifts (from relatives, friends, and the Jewish community), inheritances, hand-me-downs. Sometimes they are quietly “borrowed” from synagogues, in a kind of surreptitious lifetime loan. Sometimes they are acquired once in a lifetime, like a pair of silver candle sticks; sometimes they are reacquired annually and consumed or used up, like Hanukkah candles or a Jewish calendar; and sometimes they are acquired annually, and after they have surpassed their initial intended use, they are saved and transformed. I am thinking of etrogs (citrons used on the Sukkot festival) turned into pomanders (to be smelled at the end of the Sabbath in the Havdallah ceremony) and pieces of afikoman (the matzoh that is hidden and then found at the Passover seder) hung over doors as amulets to increase one’s blessing. This first category embraces a subset of objects whose very absence or prohibition from use at specific times points loudly, articulately, and evidently to the Jewishness of the space. Absent (or typically absent) are specifically “other” objects such as Christmas trees, wreaths, colored lights, and wicker baskets of painted eggs and chocolate bunnies, or bacon and its smell. Prohibited, and hence placed out of sight or otherwise rendered out-of-commission in particular times and places, are in some Jewish homes: cars, money, and fire on Sabbath; bread and flour on Passover; mirrors and leather shoes in the mourner’s house. In a second category are objects that are not in and of themselves considered explicitly or uniquely Jewish-signifying objects that create the Jewishness of a home and point to it (for oneself and for others who enter the space). Nonetheless, they also function, in many Jewish homes, to embody, create, and express kedushah [holiness] by their actual presence, by a hidden presence of which one is consciously or subliminally aware, and also by the whole range of interactions to which such objects are subject or suggest and provoke. They participate in the fulfillment of mitzvot, the commandments, or as Max Kaddushin would say, “Jewish value concepts.” While the definition of this category might seem curious, the objects that constitute it are not. Consider books, some of which might be by Jews or about Judaism–but also all books in abundance, filling shelves, piled on floors, spilling off of tables, scattered in children’s rooms. Consider shrine-like displays of photographs, of children, of parents, of ancestors, of extended families assembled at what Jews call “affairs.” L’dor va’dor, these things point from one generation to another: family matters, love matters, keeping connections matter, increasing and multiplying matter. In a third category, I place a whole range of material objects that could be found in any home, but whose meanings and functions shift within the context of a Jewish home. A dish is a dish, but in a Jewish home where kashrut (the dietary laws) is observed, the dishes of a certain color or pattern placed in a particular and separate cabinet become and remain milchig (milk, or dairy) dishes, and the dishes in another cabinet become and remain fleishig (meat). The telephone is a telephone, but when it’s being used by a Jew who is checking on a sick friend who lives far away, it is a klei kodesh, a holy vessel used in the practice of bikkur holim, the commandment to connect to the sick. All of the equipment one uses in house cleaning–cleansing powder, mop, Windex, Pinesol, vacuum cleaner–is just cleaning equipment. But in the Jewish home where Sabbath is observed by cleaning one’s home beforehand, we have again klei kodesh, holy vessels that create and point to the Sabbath, tangibly, experientially, and sensuously. In each case, we have objects that are endowed with meaning, memory, and sacred purposes–they are not changed, but they have the potential to become charged, so to speak.